Have you ever looked outside your window at the overcast sky and realized that the weather has officially turned chilly? That’s how I felt today when the cold morning light began filtering through my shades. I always think that this kind of weather inspires a taste for spices and hot liquids. 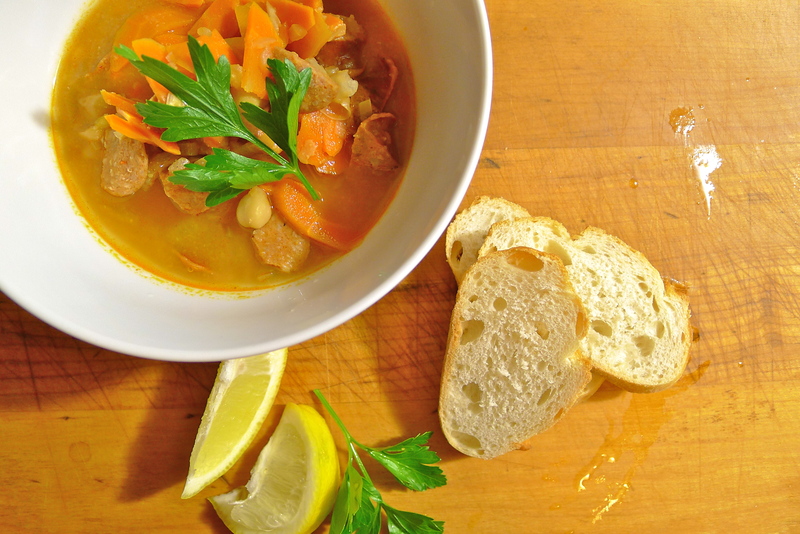 This soup, adapted from Food & Wine, certainly satisfies those cravings. There is something about Spanish food that feels perfect for this season. Maybe it’s the colors, or the strong flavors of garlic and sherry. Maybe it’s the liberal use of pimentón, whose rich and smoky heat seems to combat the gloom of gray skies. Pimentón is basically the Spanish version of paprika and comes in three varieties of varying heat: dulce (sweet), agridulce (bittersweet), and picante (hot). For general cooking purposes, I find agridulce to be just perfect, neither too mild nor too bitter. For this recipe, I used chorizo from my CSA. Given that most of the sausages from my CSA are fairly lean, I didn’t cook the chorizo beforehand. However, if you have particularly fatty links, you might wish to sauté the chorizo pieces and drain them before adding them to the soup. I also love how the recipe uses puréed chickpeas as a thickener. Sometimes I find that using flour to thicken soups, stews, stocks, and gravies can lead to slightly gluey results, and using tapioca is just weird. 1. Purée the half of the chickpeas in a food processor until they are smooth. They will act as a thickener in the soup and give the broth a wonderful nuttiness. 2. In a large Dutch oven, heat about two tablespoons of olive oil over medium heat. When the oil begins to shimmer, add the onions and cook them until they just start to turn translucent. Toss in the carrots and the garlic. When the garlic becomes fragrant, add the pimentón, cayenne pepper, and tomato paste to the vegetables. Combine everything together, taking care not to burn the spices. Once the vegetables are evenly coated with the tomato paste and the spices, add the chorizo, the puréed chickpeas, the remaining whole chickpeas, and the beef broth. Adjust the seasoning. 3. Simmer the soup until the whole chickpeas are nice and tender. You will want to skim the surface of the soup periodically. Adjust the seasoning for a final time. Serve the soup in warm bowls, topped with fresh sprigs of parsley and lemon wedges on the side. I use pearl barley to thicken mine up! Nice to see another post again BB21 … Great recipe and I like the idea of the chickpea puree as a thickener! Thank you, John! I like the idea of using puréed chickpeas too. Like mashing up half the beans in a bean soup. Oh that looks so hearty! I’d love a bowl of that right now, especially since they a. don’t do spicy in Paris b. it’s so gloomy and cold here! Also, just noticed you have a tag called “souper duper”, love it. Thanks, Edna! Yes, I remember adding too much pepper to a soup once and having a French friend freak out. Do you think it’s changing a little though? So many good Vietnamese and North African restaurants that use a lot of chili and/or spice! This sounds like a terrific soup for the fall and winter season…warm and comforting. Good looking soup and great photos. I *love* chickpeas! They are a must have item in my pantry. Your recipe looks super yummy and comforting. Can’t wait to give it a whirl! Thank you! Chickpeas are great. I love to keep them in the pantry, dried, canned, or in jars. They make a super quick and very yummy meal! I was just thinking of chickpeas! Fantastic soup! Get out of my head! I just had a chickpea chorizo soup at a little Spanish restaurant near me and was thinking MUST… DUPLICATE… The one I had was more of a stew, with a broth, but I agree that the pureed chickpeas are a great alteration to the standard. I think that if I had used dried chorizo links, maybe the color would have been a richer red? Like the photo in the original Food and Wine article? But then again, helping that food stylist for a day, I wouldn’t be surprised that they tweaked the color in post-production. In any case, it tasted fantastic — and that is the best part! Amazing that we were sitting OUTSIDE on Monday night, eh? Your soup looks grand. And, I agree: thickening soup with tapioca is just weird. I know! The weather this year has been crazy. Climate change deniers, grrrrrrrr. Thanks for the kind words about the soup! It was really good. I first heard about using tapioca when I started reading more about how to use my slow cooker. It works, but just gives a weird texture!